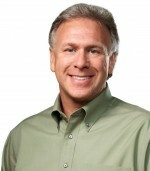 Phil Schiller is currently on the witness stand in the trial of Apple versus Samsung, and Apple's marketing chief is offering a bit of insight into the history of the iPhone, making the argument that Apple revolutionized the smartphone industry with its contributions. AllThingsD has a summary of Schiller's comments, which reveal Apple's wide-ranging thoughts on what project to pursue following the success of the iPod. Schiller said the company had been working on the tablet computer that would later become the iPad, but decided to shift its attention to the phone. “At the time, cellphones weren’t any good as entertainment devices,” Schiller said. As part of his testimony, Schiller was led through a number of public reviews and comments about the iPhone and iPad, demonstrating how the devices were considered revolutionary but that many observers believed Apple would fail in its efforts. Schiller also revealed a bit of information on iPhone marketing, noting how the company's U.S. iPhone advertising budget expanded from $97.5 million in fiscal 2008 to $173.3 million in fiscal 2010. As Apple has previously revealed in public filings, the company's overall advertising budget in fiscal 2010 came in at $691 million and grew substantially to $933 million in 2011. Still, Apple's booming sales have typically meant that the company's marketing expenditures have been shrinking as a percentage of revenues. CNET also highlights Schiller's comments on how Apple uses targeted market research surveys, which have shown how important design is to Apple's customers. Of note, Schiller also went into how the company performs market research, a controversial topic given the fact that late Apple co-founder Steve Jobs once pooh-poohed such studies, saying the company would design products people didn't even know they wanted yet. Apple brought up market research in this case to point out how important design is to consumers, 85 percent of whom, according to Apple's own 2011 study, said design and appearance were important. Schiller did his best to finesse how these surveys came to be, saying they did not go out to random people but to customers who had already purchased one of the company's devices. Schiller also said that Apple purchases third-party reports of market trends and other data. As CNET noted earlier today, Schiller will be followed on the witness stand by Scott Forstall, Apple's head of iOS software. Other Apple-called witnesses will include Samsung executive Justin Denison, Samsung engineer Wookyun Kho, Apple's early icon and interface designer Susan Kare, and a pair of independent expert witnesses. Update: Samsung's lawyers asked Schiller whether the design of the iPhone would be changing with the next version of the device, but he declined to comment on future products and Samsung apparently declined to press the issue further. If only Steve were here to be in the witness stand. Now that would be something...it might even border on Epic. Schiller did good with Apple's lawyers. But it appears (in my opinion) that Samsung is doing a good job with their cross - getting Schiller's to bury himself. The survey, the home button, etc. When Bill Gates was called to testify in U.S. v. Microsoft, the results were not pretty. He was snotty and evasive and did not do his cause any good whatsoever. Obviously Bill is not Steve, but something to put in the "be careful what you wish for" column. Apple's lawyers would have wanted him as far away from the trial as possible. They wouldn't know which "Steve" would be sitting in the chair. The smooth talking salesman or the angry and emotional Steve. Samsung's lawyers also got confused by the look-alike Samsung phones. Yes. they mixed up their own phones. They didn't hand Schiller an iPhone. ETA: I wouldn't take too much of The Verge seriously anyway - based on Forbes' account - The Verge is leaving out quite a bit while also adding their own sensationalism. Fine if you want to be entertained. Not so much if you're looking for truth. Forstall says he has 1,000 people reporting directly to him. Really? I find that hard to believe. Apple is a 20,000 employee company in corporate. Scott is a senior Vice President. I'm quite sure there's 1000 employees under his vice-presidency. Heck, our director has close to 200 people under him where I work and he's just that, a director. He has an higher level director above him before the vice-president. Our director's director probably has close to 800 or so people under him, and the vice-president has like 3-4 directions like this under him... so 1000 is actually quite small for a vice-presidency. Update: Samsung's lawyers asked Schiller (https://twitter.com/Swiftstories/status/231459716516175873) whether the design of the iPhone would be changing with the next version of the device, but he declined to comment on future products and Samsung apparently declined to press the issue further.